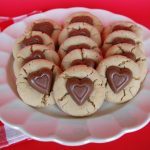 A batch of these sweet cookies will melt your Valentine’s heart! Preheat oven to 375 degrees. Line two baking sheets with parchment paper. Unwrap chocolate hearts; set aside. In a large bowl, using an electric hand mixer, beat peanut butter and shortening together. Add sugars, beat until light and fluffy. Add egg, milk, and vanilla beat until well combined. In a separate bowl, whisk together flour, baking soda, and salt; gradually beat into peanut butter mixture until well combined. Shape dough into 1 1/2-inch balls and roll in additional sugar. Place 2-inches apart on prepared baking sheets. Bake for 8-10 minutes until puffed and light brown. 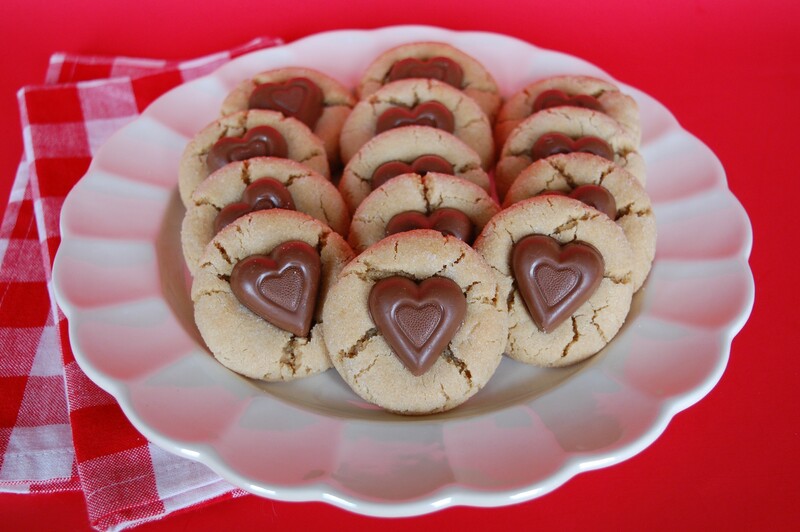 Immediately place a chocolate heart on each cookie pressing down slightly. Cool completely and store in an airtight container.